For the past three years, you’ve probably heard of the ROG OC Showdown Formula Series and Extreme Series online overclocking competitions targeting air/water cooling and extreme overclockers. With a wide range of OC-ready motherboards, graphics cards, and software available, overclocking has become simpler and more accessible. ROG always wants to bring out the best in the community by organizing fair and fun competitions that push the limits of our hardware. EK Water Blocks is also participating by providing some amazing prizes! Today, ROG is announcing a new online overclocking competition dubbed ROG OC Showdown Team Edition. The competition will start April 14th and run until June 5th on oc-esports.io. This time, ROG wanted to do something that promotes competitive team spirit and lets everyone join in the fun. Every level of experience is welcome, from newbies to experts, and all types of cooling methods are allowed, from air to liquid nitrogen (LN2). Each of the competition’s stages has its own rules and limitations to make things fair for the people participating. Teams and individual overclockers will both be rewarded from a total prize pool of $5,000 USD. 1. Create an account on HWBOT. 2. Join or create a team if you don’t have one yet. You can also join EK Water Blocks International OC here. 3. Discuss tactics and strategies with your teammates. 4. Run the benchmarks and submit your results. Learn how to submit results in this guide. The competition consists of five different stages. Each one has its own rules about which benchmarks need to be run, which leagues can join, and which types of cooling are allowed. Make sure to read the full rules on the official competition page. 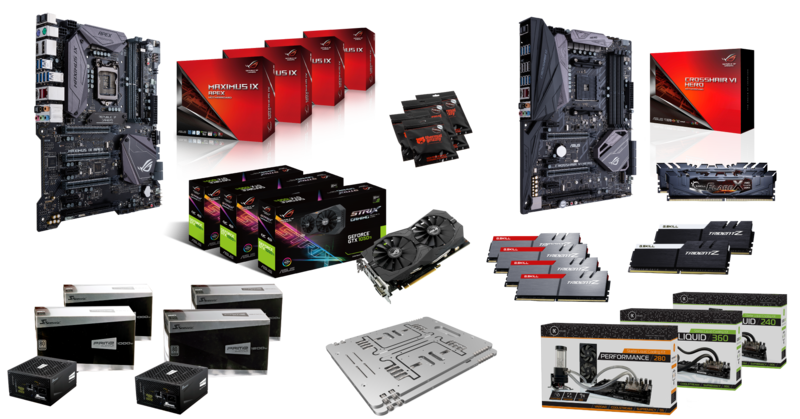 ASUS ROG team partnered with EKWB, G.Skill, Open Benchtable, Seasonic, and Thermal Grizzly to put together a collection of cool prizes to enhance your PC. Prizes will be awarded to the top two teams, and the top overclocker for each stage will receive an individual prize as well. An additional prize will be awarded to the most valuable player – the overclocker who gathers the most points overall. For the full list of prizes, visit the prizes page.